VBS Direct Ltd - VBS Ultra EFA - Innovative solutions for the veterinary professional. 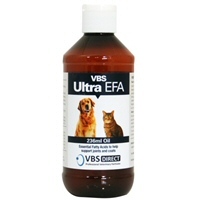 VBS Ultra EFA (236ml Oil) is a high-concentration blend, rich in essential fatty acids, designed to help support joints and encourage healthy coat condition, as well as support cardiovascular and joint inflammation. This easy to deliver formulation makes it easy to achieve clinically recommended, therapeutic dosing levels. Highly potent, bioactive, cold pressed Essential Fatty Acid blend featuring a high-grade, sustainable marine lipid concentrate, lecithin to aid absorption and a blend of vitamins and antioxidants to support healthy cell function and reduce pro-inflammatory markers. Give with meals ½ teaspoon for each 10kg of body weight daily, or as recommended by your Vet.